Glad I don’t know exactly where that is, lest I inadvertently commit a thoughtcrime. 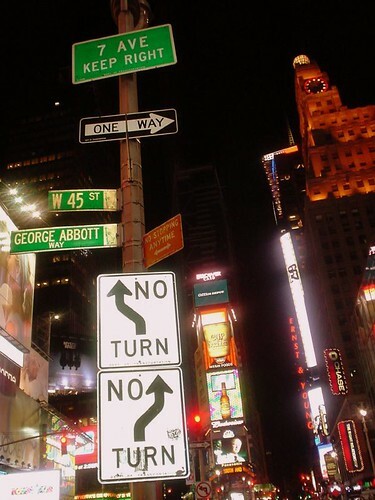 For those not in the know, those signs first appeared in NYC in 1982 during Mayor Ed Koch’s administration. Thoughtcrime issues aside, they were extremely effective – and one of the reasons I love being a New Yorker. Seriously, that’s why I love NYC. And, I’ve never been accused of being “too direct” there. OK, OK, I get it (even though I grew up in the Chicago area, which has its own brand of deliberately understated cool). BUT– am I reading the upper sign wrong? Sometimes it is allright to park there, so one has to think about it??? The top sign is about what vehicles can drive (or temporarily stop to pick people up?) in a particular lane, not about who can park there. It looks a lot like the HOV lane signs in DC. I like this one too, enough to make you schizophrenic! I love Manhattan! I stayed recently in the SoHo area in a shoe-box size hotel room costing some $200/nt.! But it was a clean, nice room. But what a city! As the great Charles Coulombe said, “I have red-state politics, but blue-state tastes”. Indeed! Despite my politics, I AM one of those guys who likes his fish raw but his meat well-cooked (well, at least medium)! I’m a food junket when it’s on the co. dime. I’ll eat just about anything, but I have to tell, say, Thai restaurants, don’t give me a 5, can you double that? Friends forced me to do the Buffalo Wild Wings Challenge, one friend even dabbed the sweat from my forehead as I delved in, but I got the T-shirt (not that I would ever wear such a cheesy accoutrement!) But, if you are into food, where else on earth can you get such splendid variety!? The top sign is for a “Buses Only” lane that exists 4pm to 7pm Monday through Friday. Once, I was in a car with some others with a friend at the wheel, one of 17 siblings born and raised in Brooklyn, who insisted on backing up the wrong way up one of the Avenues on the East Side in the 50s in order to get a parking spot (the light was changing, it was, well, somewhat clear). A completely fearless NY driver. He is known for relying on the rosary (like many NY tough guys, cops, firefighters, etc) in all things, confidently asserting its protection. For my part I just white-knuckled it until we were safely in the spot.